Do you know a nature lover? Most of us have that someone in our life who needs to get into the forest to renew himself or herself. I don't get out of my Craft Cave often enough, but just looking at the Rooted in Nature bundle gives me a sense of tranquility. I'm just wrapping up a week spent in one of the world's most beautiful National Parks, and one of the four oldest in the world - Banff National Park. Not many know this, but I was actually born in Banff, Alberta! So I have some kind of natural affinity for the Rockies. 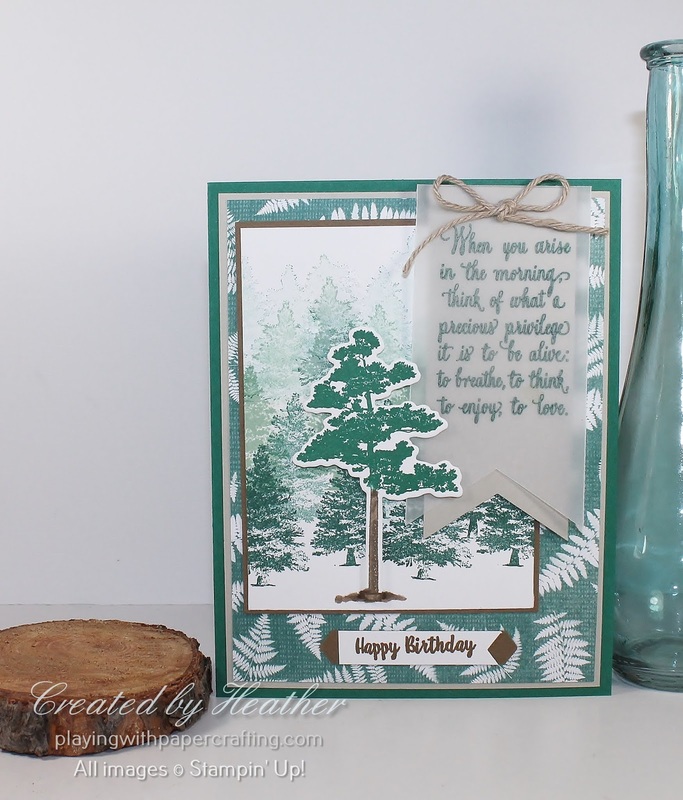 And this card is a tribute to my camping week spent in the woods! 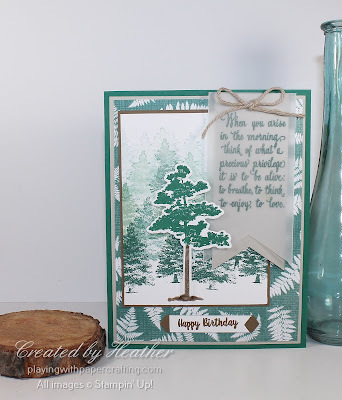 The Nature's Poem Designer Series Paper used in the background actually reminds me of Westcoast forest trails with the lush fern covered forest floors. I lived on the coast of British Columbia for many years, and we got so we took our ferny woods for granted. After living in the dry interior now for over twenty years, I realize how special it was! 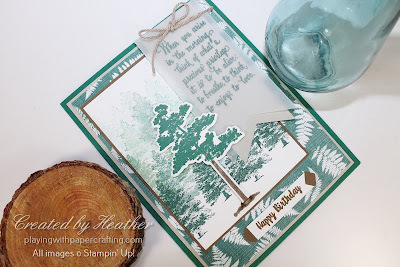 I got the forest effect on the image panel by stamping the double fir tree image from Rooted in Nature full strength and then repeatedly restamping without reinking higher and higher up the page, overlapping the last images, giving the illusion of depth. I started with Tranquil Tide and then went to full strength Mint Macaron, restamping it without reinking as well. If there were gaps, I filled them in using the single fir tree stamp at a similar level of ink intensity for that area. 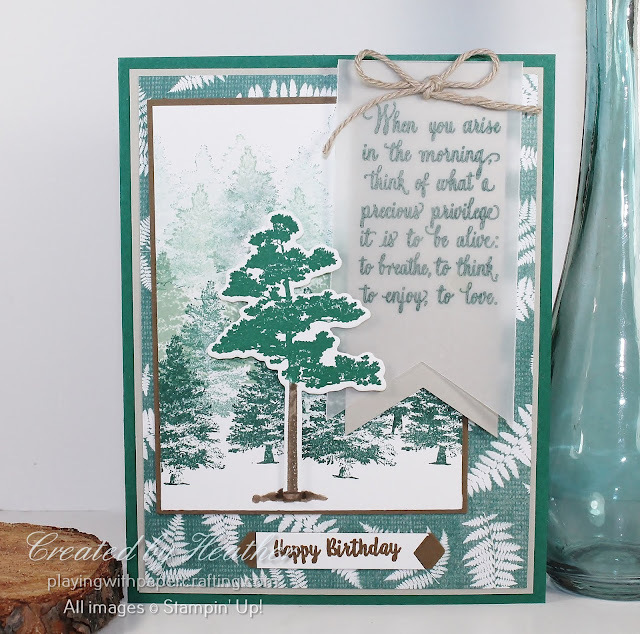 I stamped the main tree image on a separate piece of Whisper White. I used Shaded Spruce, then used a Q-tip to take the ink off the tree trunk and used a Soft Suede Stampin' Write Marker to recolour the trunk. I "huffed" on the stamp to remoisten the ink and stamped, then die cut the image using the coordinating die from Nature's Roots Framelits. It has a bit of an awkward base to the shape which I nipped off and added a base on the panel with my Soft Suede marker. Don't you love that sentiment from the Enjoy Life stamp set. I thought it would be perfect with this theme for my card. My hubby recognized the quote as one from a Roman Emperor, Marcus Aurelius, to be exact after we looked it up! I stamped it on vellum with Tranquil Tide and dried the ink with the Heat Tool so it wouldn't smear off. The background was too busy to just leave the vellum on it's own though so I added another flag of Sahara Sand behind. Don't forget that this offer is time limited. If you haven't ever tried Paper Pumpkin, this may just be the time to give it a trial run! You can save 50% off your first box! Paper Pumpkin is a delightful, all inclusive crafting surprise delivered right to your door once a month! All you need are scissors and adhesive and sometimes not even those!! Add to that, it's easy to put on hold for a month or two or cancel altogether, and it wouldn't hurt to give it a try, just for the joy you'll get from it! Go to paperpumpkin.com to subscribe and please choose me as your demonstrator!